Here is a fine example of a utility body built just at the end of the war all very square and flat with little if any panel beating due to using unskilled labour to build it. You can also see just how small the headlights were and a painted radiator rather than polished alloy or chrome, not that it had anything to do with the war but you can also see the pop out trafficators (top right of photo below). The CW series (‘W’ stood for “war”) started production in 1943 with the CWG5 which had a Gardner 7.0 litre 5 cylinder engine in total 100 were built before being superseded in the same year by the CWA6. 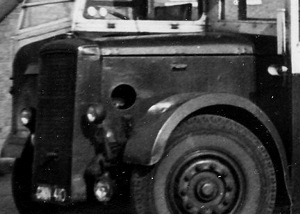 The CWA6 had an AEC 7.7 litre six cylinder engine over 800 were built until in 1945 when Daimler introduced its own 8.6 litre six cylinder engine which was called the CWD6. Production of the CWD ceased in 1946 but due to waiting for bodies some did not get on the road until 1947 the CV series (‘V’ stood for “victory”) followed with production starting in 1946. All CWs regardless of engine had the Daimler fluid flywheel four speed preselective gearbox and vacuum assisted brakes. The above bus entered service in April 1945 and was withdrawn from service in 1967 according to a fleet list I have dated 2nd April 1965 courtesy of WBUDC it states that this bus still had its Brush body so I do not think it had a rebuild but I bet it had a fair bit of touching up. At the St Helens road transport museum there was a Daimler similar to the West Bridgford one here, the engine did not have a cylinder head on so I could see it was a 6 cylinder engine. But no 2 pot was only 2" in diameter while the rest were about 4"-5" any clues? was it a start help cylinder or balance help issue. What engine was it, the fuel injector pump had 6 outlets but no 2 was slightly different. The Vacuum pump was in front of the injector pump. I remember the West Bridgford buses very well, they always looked a bit more posh than my fathers Nottingham City Transport, dad was commercial manager for many years, which meant I spent many a happy hour in the depot. A very belated answer to Ken Johnson’s question about the mysterious tiny piston visible in the temporarily headless AEC 7.7 engine of EWM 358, the ex-Southport Corporation Daimler CWA6 awaiting restoration at the St Helens Transport Museum, which I revisited with great pleasure last Saturday. One of the pistons is at top dead centre, and with an overlay of dust covering both block and piston the actual bore diameter is obscured. Clearly visible is the toroidal combustion chamber in the piston head, looking for all the world like a baby piston in its own right. To add the the confusion, the other piston that would have been at TDC is missing, so that ALL bores except for the mystery one appear empty. The only inline sixes where only one piston at a time is at TDC are two-strokes, which this engine most definitely isn’t! The whole vehicle is a major restoration project, so thanks, congratulations and best wishes to the Museum for their achievements up to now and in the future. EWM 358 It was acquired by Blundell’s coaches in March 1957 – I took my double decker test on it. Wilf Blundell who was the British Stock Car champion was a friend of Mrs Topham of Aintree and the Daimler was frequently to be seen in use as a mobile grandstand. It suffered problems with its timber body and I think that is what led to its arrival at St Helens. As a further insight to this vehicle I have just become a member of the NWTM and have the job of rebuilding the replacement engine for this vehicle, The original engine had thrown a leg out of bed (smashed the block on both sides due to con rod failure) The heads where removed for inspection. I will update this agenda as work proceeds. All utility bodies built of wood suffered from timber problems within 6-8 years, EAO, as green (unseasoned) timber was used in their construction. London Transport started overhauling their Daimler CWA6’s around 1949 and gave up about halfway through the 281 they had. They found that much of the wooden frames had completely disappeared into dust and that correcting the work was far too time-consuming and therefore expensive! They didn’t like the 12 or so CWD’s they were allocated and replaced them fairly quickly with 7.7 AEC engines recovered from scrapped STL’s. One problem with the Daimler engine was that the exhaust manifold was next to the driver and made the cab very hot at times. Also the timing chain was at the rear of the engine and difficult to access. Isn’t the subject of utility buses fascinating??? Gardner engines also had the exhaust on the right hand side, and that certainly didn’t influence their acceptability. I understand, also, that the Daimler CD6 engine had timing gears rather than a timing chain. Both the CD6 and the contemporary Crossley HOE7 copied exactly the bore and stroke dimensions of the pre-war Leyland 8.6 litre unit, but neither came remotely near that fine engine in terms of performance and dependability. The location of the timing train at the rear of an engine permits more accurate timing and allows the entire engine unit to be more compact. The rear location of the timing gears does reduce accessibility, but this only becomes an issue if the engine is of dubious reliability. Dennis adopted rear timing gears in the mid 1930s, and reliability was never an issue with Guildford power plants, unlike those of Daimler and Meadows. Daimler’s engines were of exceedingly variable quality, ranging from appalling to excellent, and London Transport quickly gave up on them. Daimler soon limited the fitment of its own CD6 diesel to single deck versions of the CVD6, where the unit was subject to rather less stress. The Freeline underfloor engined model used the larger 10.6 litre CD650. EWM 358 update; The engine has now been rebuilt and should be test run this week, prior to cleaning and refurbing the engine bay. The bearings in the fluid flywheel are at present trying to be sourced as they are the original Hoffman type 325/340 and have so I believe been obsolete for some years, There are however possible alternatives. The intention being is to refit the engine so the vehicle can be moved under its own power to facilitate restoration. EWM 358 update. The replacement engine has now been test run and is in good working order, the engine bay is currently being refurbed in preparation for the engine fitting hopefully before Christmas. A question for all you bus people out there,The Original engine does NOT appear to have a dynamo fitting anywhere on the block. I maybe clutching at straws here but were these fitted with Dynostart units, as all the main battery leads are on the starter side only. The replacement engine is from a AEC Matador Ex service vehicle and was fitted with the Dynamo unit on the LHS Driven off the vacuum pump, which we are having trouble sourcing as we need the star drive and shaft with it. The dynamo on postwar Daimlers was driven by belts from the input to the gearbox, which was mounted half-way down the bus, so there would be no dynamo on the engine. I can only assume that wartime Daimlers were the same. Thanks for your info David, I will put the boiler suit on and have look. As usual I will keep you posted and will put some pictures on soon. The subject of early timber framing deterioration in utility bodies is indeed true in the large majority of cases, but there were certain very commendable exceptions. Samuel Ledgard was very fortunate in this respect and seemed to have reasonably minimum trouble with theirs, new or second hand, whether built by Duple, Roe, Park Royal or Brush. One minor manufacturer though really did "let the side down" – Pickerings, and the two that the Ministry "treated" Ledgard’s to were so ugly and they looked like falling apart very early on. The Duple and Roe ones mostly gave approaching twenty years top line service with little attention other than the "in vogue" fitting of sliding windows to replace the half drop originals. Even the "Sutton depot" ex London Park Royals appeared to escape major timber rot. As with many other folks I find the subject of the utilities to be endlessly fascinating and I greatly enjoyed conducting and driving them. To be fair, Chris Y. most of LTE’s 1946 Park Royal CWA6’s that Samuel Ledgard acquired in 1954 were overhauled in both 1949 and 1952, so most of the green wood was probably replaced by the time of sale! I’d say that SL got a bargain with them. Those of this batch which went to Belfast Corporation were re-bodied immediately by Harkness, which seems a little unnecessary at that point in time. Since Morden accommodated both Sutton and Merton vehicles, it’s certain that some of these buses had both you and me travelling on them at some point in time, Chris Y! The Guys Arab I’s might well have more robust chassis, but the Daimlers were more sophisticated: a classier act, IMHO. My joy was when they were used on the Morden to Epsom Raceday specials. I used to save up much of my pocket money and bunk off school for these rides. The conductors would often not take my fares, bless ’em! It is right to say that the CWD-engined ones performed better, but, if memory serves, there were only 12 of them!. EWM 358 update, I have now found the dynamo located underneath the bus as advised by David, While I was under there I was amazed at the condition of the lower timber floors and the body out riggers, certainly they are black, but they appear in general rot free, it is intended when the engine is soon to be installed, to remove some of the side panels for inspection, but if the ones that cant be seen are in the same condition as the lower ones the restoration maybe a lot less involved. 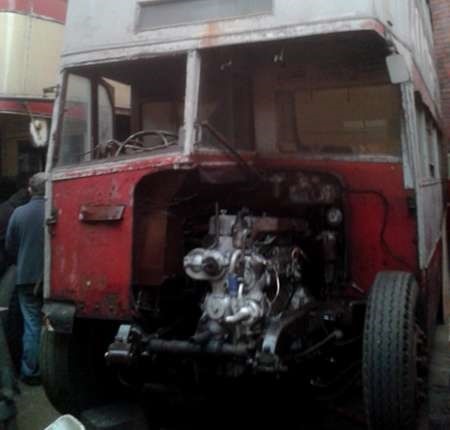 EWM 358 update, The engine is now fitted back in the bus, However nothing is yet connected to it so it has not yet warmed the exhaust. Its nice to see it in its rightful place after all the years. This is all very interesting, John P. Do keep us informed of progress. Glad that the body condition seems to be positive. As a member of the above museum, I have been helping John with some of the engine replacement in the bus, as he says we ran the engine on a ‘dolly’ outside the museum a couple of weeks ago and it ran ok.
Will be nice to see it move under it’s own power after over 30 years as a static – albeit – somewhat derelict exhibit! Cannot wait to see it move under it’s own power in the future! As promised update on EWM358, after changing the oil and conneecting the fuel system, Batterys were connected and after a few seconds on the starter the engine fired for the first time in the bus. It smoked a bit then settled to a nice tickover. However we do have a leak problem with the radiator it appears to have rusted some of the tubes out, but we will see what can be done. OK now for the I need help bit. I know that this bus was supplied new to Southport in 27/02/1945 Fleet No 62 and was in service with them till 1953/4 and then sold to Wilf Blundell Circa 1957, it then went to Aintree race course as a mobile grandstand where presumably it threw the con rod through the block,it was later bought by a soliciter which is how it came to be in our museum. Can anyone fill in the gaps with the history, or even have photos especially when it was at Aintree. Belfast were aware of the issues with the utility bodies so having refurbished the chassis and fitted a new body these vehicles were a lesser cost route for a brand new vehicle effectively. They weren’t rebodied immediately – they were acquired in 1953 and rebodying did not commence until 1955/6. All gave 15 year lives so BCT got good value out of their vehicles. One example 476 (GYE 98) former LT D93 is preserved. Not many Urban District Council’s had there own bus concern but West Bridgford which is on the outskirts of Nottingham was one of them. The council started the bus service to connect to the Nottingham tram system which did not get as far as West Bridgford in 1913. It is a shame how it all ended for West Bridgford Urban District Council but they had to save money because of a drop off in passengers and tried to introduce one man operation with three AEC Swifts. Unfortunately the union would not go along with it so they decided to cut there losses and sell to Nottingham Corporation in 1968. There is a very interesting historic article regarding West Bridgford Urban District Council transport here on the website of Peter Gould. Just browsing the internet and I find a great piece of nostalgia. I lived in Nottingham in the 50s/60s and I definitely would have travelled on this bus many times. The photo is taken at the old Broad Marsh bus station, which at that time was situated on an area of flattened land following the demolition of old Victorian back-to-back terraced houses. Note the red of several old Barton buses/coaches in the background. They shared the bus station, along with South Notts and Nottingham Corporation Transport. The bus shows route number 68 to Clifton (where I lived) via Trent Bridge, which was a joint operation with South Notts and Nottingham Corporation Transport. This takes me back to when I was a young lad about 14 West Bridgford Urban District Council ran a free service from Clifton to the supermarket advertised on the side of the above bus "Gem" which is where Asda is now. I used to travel a lot to Gem on this service with my mum, and I used to use the service some times as a way of getting into town for free. Great images of a much lamented and long departed fleet. Just one small, probably nit-picking, comment – West Bridgford has no "e" in it. Looking at the photo again, I definitely travelled on that bus many times as a kid because I’ve noticed something on it which used to intrigue me even then. Look at the entrance area; there is a metal pole in the middle running full height. I always assumed that was added at a later stage, to deal with some distorting or bodywork rigidity problem. Or was it always designed to be there? 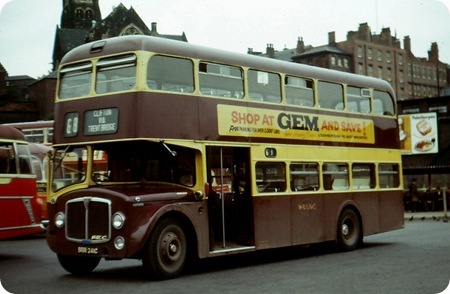 This looks like a very modern bus, most of the fleet were very old, we called them "Wessers" I lived in Clifton 1953 – 68 and often caught one of the wrecks into Nottingham. When you waited at one of the stops in Clifton, everyone groaned when one of these dinosaurs turned up! Because they had to use the Wilford route they were very low, to get under the railway bridge, and the upstairs was ok if you were a midget! the gangway was sunken into the floor at one side and the seats were "fourers". I also took this bus between Clifton and Nottingham and to Gem Supermarket many times. I agree with what Stew Wisher says – I’d forgotten about little details – for example how people would groan when they saw an old bus coming going by the long route via Wilford Lane. By the way – I remember Stew Wisher from Fairham! I lived in Clifton on Bainton Grove between 1953 and 1976. I have now been living in Rabat, Morocco for many years – you should see the buses here! Until Clifton Bridge over thee Trent opened (in 1958 I think) all Clifton services ran via Wilford Lane, as Stewart and James will remember. It was a tri-partite joint service with Nottingham City Transport, South Notts and WBUDC, so all were running lowbridge buses. When the estate was first built about 1950 NCT (who until that time had no lowbridge buses and only a very small fleet of single deckers) bought a few second hand Utilities from somewhere "up north" as a stop-gap. About 1953 they bought 10 new AEC Regent IIIs with Park Royal lowbridge bodies (SAU 199-208). Later when the new bridge was opened, the NCT share of the routes was diverted that way with full height double deckers from the brand new fleet of Leyland PD2/40s (1 ATO-45 ATO). Interestingly, for many years afterwards the route numbers remained common to all three operators (61, 61A, 66, 67 and 68) even though the NCT share took a different route to the city. The AEC Renown photo flummoxed me because I lived on Eltham Road in West Bridgford from 1947 until after the demise of WBUDC buses in 1968, and this was near to the entrance to the depot, so I saw dozens of their buses every day on their way in and out. I cannot remember EVER seeing such a bus! I was very familiar with the fleet, including the low roof jobs used on the Wilford Lane route to Clifton. In addition my mother was a clippie during the war years, and my uncle Bill Whitten was a driver throughout the 50’s and early 60’s. I just cannot reconcile the photo with my memories. I rode probably thousands of times on the 14 and 21 routes too, and again the photo means nothing. Quite a mystery, and I wonder if it was a one-off purchase that was not retained…. Peter Gould’s site, referred to above, has a fleet list as well as a historical article. There were two Renowns, 41 and 42 purchased 4/65. They passed with the rest of the fleet to Nottingham 9/68, where they were renumbered 393 and 394. 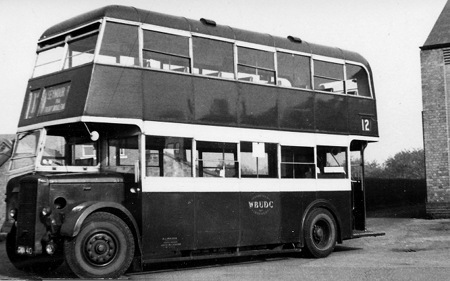 As a lad growing up in WB in the early to late 1940s I remember all the old WBUDC buses. They seemed to have only one, two or three of each type. I don’t know the technical details but some registration numbers come back to me such as ARR 831 and 832, FNN 101-3, and there were two even older buses usually kept at the back of the Depot on Abbey Road which were included in NCT’s stock after the takeover. One of them is illustrated in John Banks/GHF Atkins books on Nottingham City Transport which are full of nostalgia. I think that at some stage I must have travelled on every WBUDC route apart from perhaps the No.12 (Seymour Road). Does anybody know if any WBUDC buses were saved? The only preserved ex-West Bridgford vehicle I’m aware of is no.24, CCX 777, the ex-Huddersfield Daimler CWA6. But despite having spent longer with West Bridgford than it did with Huddersfield, it has never carried West Bridgford livery in preservation. I don’t know if it still exists, but certainly up to 1995 WBUDC 21 (ORR 140) was preserved. This was one of the lowbridge manual gearbox AEC Regent IIIs with Willowbrook body, bought by the UDC in 1954. Does anyone know of its whereabouts (or fate)? Peter There is a second ex West Bridgford bus in preservation, 21 (ORR 140), one of the pair of lowbridge Willowbrook bodied Regent IIIs new in 1954. It is preserved in WB livery and was active in the 70s and early 80s. I understand an extensive renovation has recently been completed, so hopefully it may be out and about again soon. Thank you both. I regard WBUDC as having had one of the best of municipal liveries, and it would be good to see it in the metal again. I remember the AEC Renown appearing with South Wales in the early 1960s. There were two batches – the first by Park Royal, and the later ones by Willowbrook. They worked on routes formerly operated by either low height regents or Bridgemasters. There was one unique Renown. Local operator West Wales bought one, Willowbrook bodied and resplendent in a grey livery with red trim, to operate on the joint service from Swansea to Llandeilo. 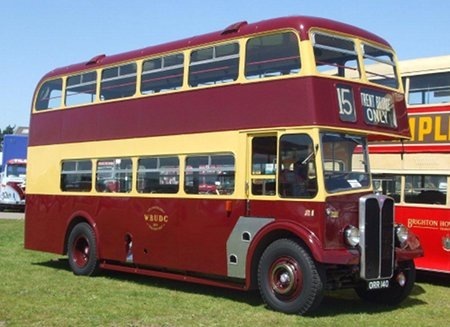 South Wales also had ten of the former six wheel single decker Renowns – they survived until about 1955. Mark, according to BBF18 the first batch of South Wales Renowns were the first in service anywhere. There is mention above of the preserved AEC Regent III/Willowbrook ORR140. This photo was taken at the AEC Rally in May of this year, showing its current condition. It would seem the biggest user of the Bridgemaster was Western Welsh taking 31 in all. They also had three Renowns delivered in 1965 part of a batch of 28. Thankfully WW did not have any of the frightful front entrance Bridgemasters that S Wales received from Park Royal. They were frightful! The WW Renowns had very smart Northern Counties bodywork. I have just read the extremely interesting details on your Nottingham page from Michael Elliott regarding the vehicle allocations between NCT South Notts and WBUDC on the Clifton services. Please could anyone out there tell me how many vehicles of each fleet were allocated to the West Bridgford town services. Talking of Renowns, could anyone confirm which were two-pedal (i.e. monocontrol)? ‘Bus Lists On The Web’ only gives two as 3B2RA (the ‘King Alfred’ ones) but it is my understanding that there were a further eight – these two West Bridgford, the five Wolverhampton, and the prototype 8071ML. Can anyone confirm? Surprisingly, ‘Bus Lists On The Web’ doesn’t mention either of the prototypes. An interesting thing about the Nottingham/West Bridgford Renowns – the operator buying the most Renowns new was City Of Oxford (43), but the operator running the most altogether was Nottingham (44 – the 42 bought new, and the two ex-West Bridgford). David B, the only true town services that WBUDC operated were routes 1 and 2 run at school times (to the Grammar School I think) from different parts of WB – so probably one vehicle each, as they were converging on the school at the same time. All of the other WBUDC services were joint operations with NCT to Nottingham South Parade (which is the south side of the Old Market Square). The route numbers (excluding Clifton) were 11, 12, 14, 15, 15A, 21 and 24. I don’t know the vehicle split on those routes. It always seemed about 50/50. Maybe Michael will be able to come in with vehicle numbers. South Notts played no part in these operations – only the Clifton services. Clifton was a strange case, because until Clifton Bridge was opened in 1958, the only route from Nottingham to Clifton estate (which was part of the city) was over Trent Bridge and through West Bridgford, who therefore demanded a slice of the action. It appears to have been quite an acrimonious wrangle before the traffic commissioners. The NCT/WBUDC Joint Operation Agreements (the original of 15/9/27 and the subsequent agreement, when services were extended from Grey Friar Gate to the Old Market Square, dated 30/6/30)provided for an equal split of vehicles between the two operators. I have some details of the split between the two operators as the situation was in 1968. For the 15/15a the split at Monday to Friday peak periods was two buses each, with the off peak/evening Monday to Friday split being one bus each. On Sunday the split was one bus each. On Saturdays the split was two buses each during the day with one bus each during the evening. So a 50/50 split here. For the 21 I only have information for the Monday to Friday operation. The split for Monday to Friday peak operation was West Bridgford five buses and NCT four buses. The inter peak period appears to be West Bridgford three buses to NCT’s one (but NCT provided the three extra buses required for the mid day peak service). During the evening three buses were required with the split being West Bridgford two to NCT’s one. During Monday to Friday evenings services 11/12/14/24 inter worked with a 30 minute headway on each service worked by five buses. The split was NCT three buses and West Bridgford two buses. The morning and afternoon peak service on services 11/12/14/24 required a total of 18 buses, with the inter peak service requiring eight buses. Additional buses would have been needed for the mid day peak. The total WBUDC Monday to Friday peak vehicle requirement was 23 vehicles during the morning peak and 24 during the afternoon peak. The morning total was made up of five buses on Cliftons, two on the West Bridgford schools service which leaves 16 for the joint services. Given that two buses were on the 15/15a and five on the 21, the remaining nine were on services 11/12/14/24. The afternoon peak required 24 buses because of the additional bus on Cliftons with the other totals unchanged. An additional bus was required for the GEM ‘free bus’ during the afternoon peak when this was in operation (Wednesday, Thursday and Friday, I think). A big thank you to Michael Elliott and Stephen Ford for the above information. Although I have lived in West Bridgford all my life and taken a keen interest in WB buses I have not paid much attention to the actual services. This interest was sparked off by the acquisition of a mint condition 1956 WBUDC timetable book at the Sandtoft gathering this July. This reminded me of another long forgotten artefact which I have hidden away. One day when walking home from Rushcliffe School in the late 1970’s I was passing the old green metal bus shelter on Melton Road which used to stand near the end of Devonshire Road. I noticed the corner of something sticking out from behind the NCT timetable case, I pulled it out to reveal a sheet of varnished plywood with the old WBUDC timetable pasted to it, needless to say it was spirited away. Next year is the centenary of motor buses in West Bridgford, and I gather that NCT intend to paint a bus in the old maroon and deep cream to commemorate this, I think it looks likely to be Scania Omnidekka 955 as this has not been repainted in Bridgford Bus green livery like its sisters 952-954. There are already posters displayed inside these buses with a basic timeline of the history. David C – as far as I am aware there were ten ‘two pedal’ Renowns (model 3B2RA). These were the demonstrator 8071 ML, the two ‘King Alfred’s’ 595/596 LCG, the two West Bridgford’s BRR 241/242C and five Wolverhampton’s HJW 182-186D. Some general sources on AEC Renowns quote the Wolverhampton’s as model 3B3RA but other sources dealing with Wolverhampton quote them as 3B2RA, which fits in with Wolverhampton’s preference for ‘two pedal’ control Guy Arabs.